A new spectrophotometric method is developed for the determination of phenylpropanolamine HCl (PPA), ephedrine HCl (EPH) and pseudoephedrine HCl (PSE) in pharmaceutical preparations and spiked human urine. 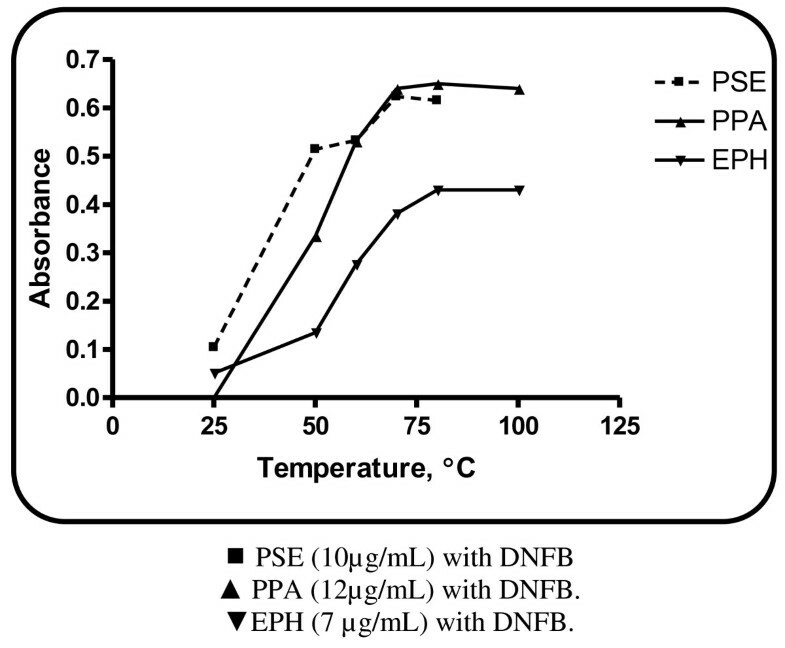 The method involved heat-catalyzed derivatization of the three drugs with 2,4-dinitrofluorobenzene (DNFB) producing a yellow colored product peaking at 370 nm for PPA and 380 nm for EPH and PSE, respectively. The absorbance concentration plots were rectilinear over the range of 2-20 for PPA and 1-14 μg/mL for both of EPH and PSE, respectively. The limit of detection (LOD) values were 0.20, 0.13 and 0.20 μg/mL for PPA, EPH and PSE, respectively and limit of quantitation (LOQ) values of 0.60 and 0.40 and 0.59 μg/mL for PPA, EPH and PSE, respectively. The analytical performance of the method was fully validated and the results were satisfactory. The proposed method was successfully applied to the determination of the three studied drugs in their commercial dosage forms including tablets, capsules and ampoules with good percentage recoveries. The proposed method was further applied for the determination of PSE in spiked human urine with a mean percentage recovery of 108.17 ± 1.60 for (n = 3). Statistical comparison of the results obtained with those of the comparison methods showed good agreement and proved that there was no significant difference in the accuracy and precision between the two methods. The mechanism of the reaction pathway was postulated. Phenylpropanolamine hydrochloride, (PPA) is (1RS, 2SR)-2-amino-1-phenylpropanol hydrochloride  (Figure 1). It is a largely indirect acting sympathomimetic with an action similar to ephedrine; it is orally administered for the treatment of nasal congestion. It is frequently used in mixture preparations for the relief of cough and cold symptoms. Other uses of phenylpropanolamine include; the control of the urinary incontinence in some patients. It has also been used to suppress appetite in the management of obesity . The United States Pharmacopoeia (USP)  and the British Pharmacopoeia (BP)  recommended non-aqueous titrimetric method for the determination of PPA in the pure form in presence of mercuric acetate, using perchloric acid as a titrant and crystal violet as indicator. On the other hand, USP  recommended HPLC method for its determination in dosage forms using a mixture of (1-hexanesulfonate, monobasic sodium phosphate and triethylammonium phosphate) and methanol as a mobile phase with UV detection at 210 nm. Structural formulae of the three studied drugs. Due to its clinical advantages, PPA received a great interest. A good guide to the work published is found as comprehensive monograph in analytical profiles for drugs . Several analytical techniques have been reported for PPA determination either perse or in pharmaceutical preparations and biological fluids including; titrimetry , spectrophotometry , fluorimetry , HPLC , capillary electrophoresis , flow injection  and gas chromatography . 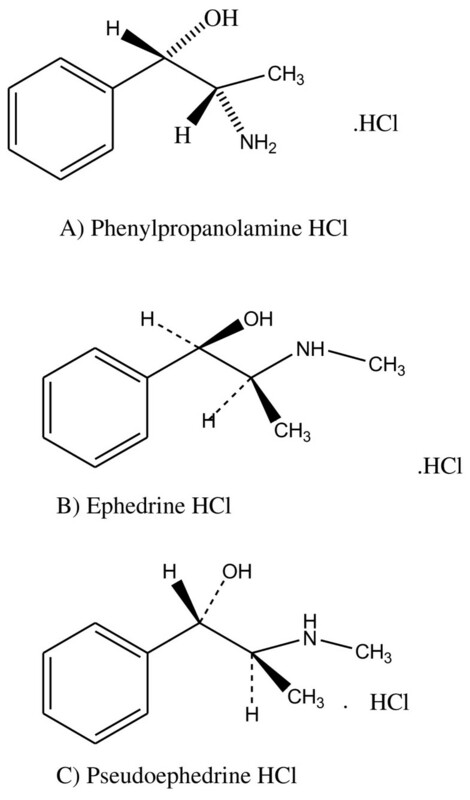 Ephedrine hydrochloride (EPH) is (1R, 2S)-2-(Methylamino)-1-phenylpropan-1-ol hydrochloride  (Figure 1). It is a sympathomimetic drug with direct and indirect effects on adrenergic receptors. It has alpha and beta-adrenergic activity and has pronounced stimulating effects on the central nervous system . It is reported to reduce the viscosity of tenacious sputum and is used as an expectorant. The USP  recommended a non aqueous titration method for its determination in pure form in presence of mercuric acetate and titration with 0.1N perchloric acid using crystal violet as indicator. The BP  favored a potentiometric titration method for its determination in pure form using 0.1 M NaOH as a titrant. Both of USP and BP recommended HPLC method with UV detection at 263 nm for its determination in dosage forms. Various reports have been described for the analysis of EPH A good guide to the work published for EPH is found as comprehensive monograph in analytical profiles for drug substances . Several techniques were reported for its determination including; titrimetry , spectrophotometry , fluorimetry , flow injection , capillary electrophoresis , TLC , HPLC , and gas chromatography . Pseudoephedrine HCl (PSE) is (1S, 2S)-2-(Methylamino)-1-phenylpropan-1-ol hydrochloride  (Figure 1) is a direct and indirect sympathomimetic. It is a stereoisomer of ephedrine and has a similar action, but has been stated to have less pressor activity and fewer CNS effects. It is given orally for the relief of nasal congestion. They are commonly combined with other ingredients for the relief of cough and cold symptoms . Also the USP  recommended a non aqueous titration method for the determination of PSE in its pure form in presence of mercuric acetate and titration with 0.1 M perchloric acid using crystal violet as indicator. The BP  preferred a potentiometric titration for its determination in pure form using 0.1 M NaOH as a titrant. Both USP and BP recommended HPLC method with UV detection at 254 nm and 258 nm, respectively, for its determination in dosage forms. A good guide to the work published for PSE is found as comprehensive monograph in analytical profiles for drugs . The literature revealed that the analysis of PSE was through techniques such as; spectrophotometry , flow injection , capillary electrophoresis , HPTLC  and HPLC . Sanger's reagent (DNFB), on the other hand, has been utilized as a chromogen for the spectrophotometric estimation of many compounds of pharmaceutical interest such as desloratadine , enalapril , lisinopril  and gabapentin . - A consort NV P901 digital pH Meter (Belgium) calibrated with standard buffers was used for checking the pH of the buffer solutions used. - Sigma laborzentrifugen (2-16p) Centrifuge (Germany). All the reagents used were of Analytical Grade and distilled water was used throughout the work. - Phenylpropanolamine HCl, batch # 41204 and ephedrine HCl, batch #135705, were kindly supplied from Egyptian Pharmaceutical Industries CO. E.P.I.CO (10th of Ramadan-Egypt) with purity of 100.55% and 100.99% for PPA and EPH, respectively as determined by the official method . - Pseudoephedrine HCl, batch # 050727 was kindly provided from Sigma Company, its purity was 99.65% which was determined according to official method . - 2, 4 dinitrofluorobenzene (DNFB) (Fluka Chemie, Germany) was freshly prepared as 0.3% (v/v) methanolic solution. - Borate buffer solution (0.2 M) was prepared by mixing appropriate volumes of 0.2 M boric acid and 0.2 M NaOH and adjusting the pH using a pH Meter. The buffer solution was kept in the refrigerator and left to reach the room temperature before use. - Methanol, hydrochloric acid (32%), boric acid and tween-80 were purchased from (BDH, UK). - Cetyltrimethylammonium bromide (cetrimide) was obtained from Merck (Darmstadt, Germany), 1%, (w/v) aqueous solution was prepared. - Sodium dodecyl sulphate (SDS) 95% was obtained from Winlab (Middlesex, England), 1%, (w/v) aqueous solution was used. - Urine samples were obtained from a healthy female volunteer around 30 years. - Allercet capsules, batch # 820304, each capsule labeled to contain 30 mg PSE and 10 mg cetirizine HCl, product of Global Napi Pharmaceuticals, 6th of October City-Giza-Egypt. - Contaflu tablets, batch # 061342, each tablet labeled to contain 24 mg of PPA, 3 mg of chlorpheniramine maleate and 200 mg of propyphenazone, product of Egyptian Int. Pharmaceutical Industries CO. E.P.I.CO,10th of Ramadan City, Egypt. - Ephedrine ampoule, batch # 11, each ampoule (1 mL) labeled to contain 30 mg of EPH, product of Chemical industries Development(CID)-Giza-A.R.E. Standard stock solutions of the studied drugs were prepared by dissolving 10.0 mg of each of the studied drugs in 100 mL of distilled water. Serial dilution with the same solvent was performed to obtain the appropriate concentration range. These solutions were stable for at least 10 days when kept in the refrigerator and protected from light. Aliquot volumes of PPA, EPH and PSE standard solutions covering the working concentration ranges were transferred in to a series of screw capped test tubes, followed by specific volume of borate buffer at pH 8.0. Then, the specific volume of 3% (v/v) of DNFB was added. The test tubes were heated in a thermostatically controlled water bath at 70°C in case of PSE and at 80°C in case of EPH and PPA, respectively. The solutions were heated for 25 min in case of PSE, EPH and for 20 min in case of PPA, respectively. The reaction was stopped by cooling under tap water, then 0.2 mL of concentrated HCl was added and the contents of the test tubes were then transferred in to 10 mL volumetric flasks, diluted to the volume with specific solvent and mixed well. The absorbance of the resulted product was measured at 370 nm in case of PPA and at 380 nm for EPH and PSE, respectively against a reagent blank prepared simultaneously. The absorbance of the resulted solution was plotted versus the final concentration of the drug (μg/mL) to obtain the calibration graphs. Alternatively, the corresponding regression equations were derived. An accurately weighed quantity of the mixed contents of ten capsules or powdered tablets equivalent to 10.0 mg of PSE or PPA were transferred into conical flask and extracted with 3 × 30 mL of distilled water in case of PSE and PPA, respectively by sonication for 30 min. The solution was filtered into 100 mL volumetric flask and completed to the volume with the same solvent. Aliquots covering the working concentration ranges were analyzed as described under" Construction of the Calibration Curves". The concentrations of the drugs were determined using, either the calibration curves or the corresponding regression equations. The contents of ten ephedrine ampoules were emptied and mixed well. An accurately measured volume of the resulting solution equivalent to 10.0 mg of EPH was transferred into 100 mL volumetric flask, and diluted to volume with distilled water. Aliquots covering the working concentration ranges were analyzed as described under" Construction of the Calibration curve". The concentration of EPH was determined using, either the calibration curves or the corresponding regression equation. Five mL of human urine were spiked with 20, 40, 60 μg/mL of PSE were transferred into series of centrifugation tubes, the solutions were then rendered alkaline with 0.5 mL of 5 M KOH to liberate the base, followed by 3 g of NaCl as described by Avois et al . The spiked urine is then extracted with three portions each of 2 mL of ter.-butyl methyl ether (TBME), centrifuged for 5 minutes at 2500 g. After centrifugation, the clear supernatant was collected, evaporated till dryness under nitrogen gas. The residue was dissolved in 3 mL of distilled water and completed as described under "Construction of the Calibration Curve. 2,4-dinitrofluorobenzene (DNFB) as an active aryl halide reacts with primary or secondary amine in aqueous alkaline medium to form a yellow colored product through a nucleophilic substitution reaction . 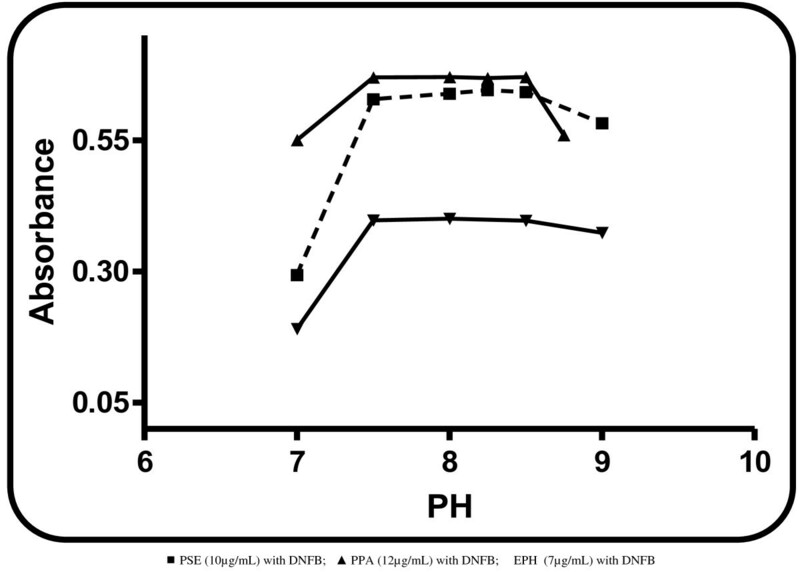 The presence of primary amine in PPA and secondary amine in both of PSE and EPH which are highly susceptible for derivatization reaction with DNFB initiated the present study. In the present study, the studied drugs were found to react with DNFB in borate buffer producing a yellow color peaking at 380 nm for EPH and PSE and at 370 nm for PPA, respectively (Figure 2). Absorption spectra of the reaction products. Experimental parameters affecting color development and its stability were carefully studied and optimized; each was changed while others were kept constant. Experimental parameters include; effect of pH, volume of buffer solution, volume of DNFB solution, heating time, surface active agent (SAA), temperature and effect of diluting solvent. The reaction between the investigated drugs and DNFB was investigated over the pH range of 7.0- 9.0 using 0.2 M borate buffer. The reaction showed the highest absorbance value in borate buffer of pH 8.0 ± 0.5 for EPH, PPA and PSE. Therefore, pH 8.0 was selected as the optimum pH value throughout this study (Figure 3). Effect of the pH of 0.2 M borate buffer on the reaction product. It was found that increasing the volume of 0.2 M borate buffer produced a corresponding increase in the absorbance value of the reaction product up to 0.5 mL for PSE and EPH and 0.8 mL for PPA, and it remained constant up to 1.0 mL for PSE, 1.2 mL for PPA and 1.5 mL in case of EPH, respectively (Figure 4). Therefore, 0.8 ± 0.2 mL for PSE, 1.0 ± 0.2 mL for PPA and 1.0 ± 0.5 mL for EPH were chosen as the optimum buffer volume for the analysis. 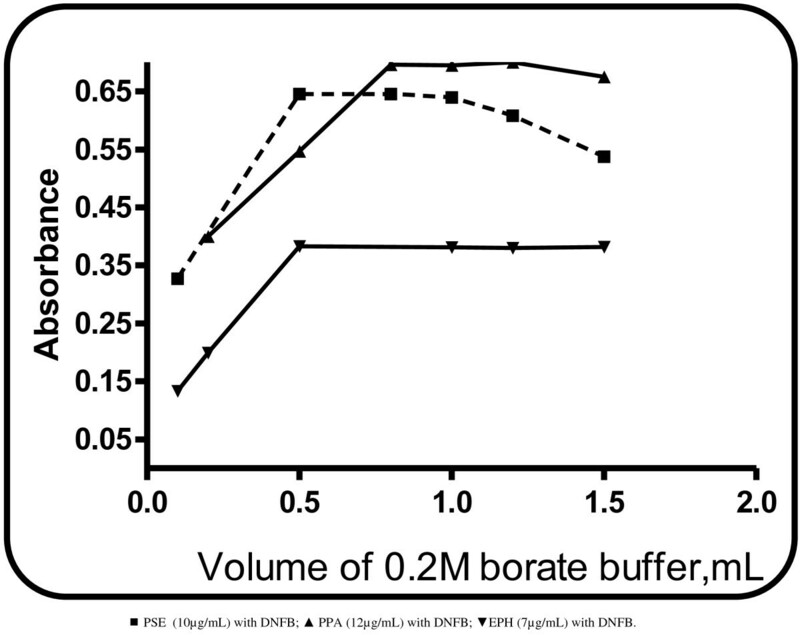 Effect of the volume of 0.2 M borate buffer on the reaction product. The influence of the volume of DNFB was studied using different volumes of 0.3%, (v/v) solution of the reagent. It was found that increasing volumes of the reagent produced a proportional increase in the absorbance value up to 0.6 mL for PSE, 0.5 mL for PPA and 0.6 mL for EPH. However, no further increase in the absorbance value was achieved upon increasing the volume of the reagent up to 1.2 mL for PSE, 0.7 mL for PPA and 1.0 mL for EPH. 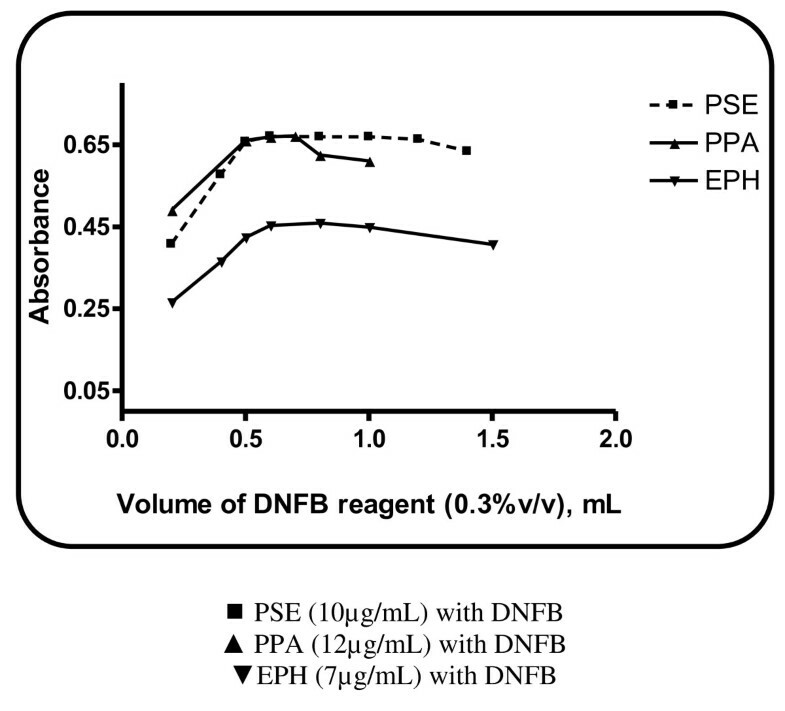 Therefore, 0.8 ± 0.2 mL for PSE, 0.6 ± 0.1 mL for PPA and 0.8 ± 0.2 mL for EPH of 0.3%, (v/v) DNFB solution were chosen as the optimal volume of the reagent (Figure 5). Effect of volume of reagent on the reaction product. Upon the reaction of any of the studied drugs with DNFB a yellow colored product was attained along with the alkaline hydrolysis product of DNFB (2,4-dinitrophenolate), which exhibits an intense yellow color . The spectra of the two products are overlapped rendering impossible measurement of the analyte derivative. However, upon acidification with conc. HCl after the completion of the reaction, the yellow 2, 4-dinitrophenolate turns to the colorless 2, 4-dinitrophenol, allowing the quantitative measurement of the Drug-DNFB derivative which remains stable up to 60 min . The effect of the heating time of the reaction between the investigated drugs and DNFB was studied. Increasing the heating time resulted in gradual increase in the absorbance value of the reaction product up to 20 min for PSE, 15 min for PPA and 20 min for EPH, respectively, after which no further increase in the absorption intensities occur. Therefore 25 ± 5 min for PSE, EPH and 20 ± 5 min for PPA were chosen as the optimum buffer volume through this approach (Figure 6). Effect of heating time on the reaction product. In order to obtain the highest and most stable absorbance, the effect of the reaction time and heating temperature was investigated (Figure 7). It was found that, the reaction proceeds very slowly at room temperature. A gradual increase in the heating temperature produced a significant increase in the absorbance of the reaction product up to 70°C for PSE, 80°C for PPA and EPH, respectively. Therefore, heating was achieved at 70°C for PSE, 80°C for PPA and EPH, respectively. Effect of heating temperature on the reaction product. The effect of diluting solvent was tested using different solvents viz water, methanol, acetone, acetonitrile, dimethylformamide, dimethylsulfoxide and isopropanol. Using water as diluting solvent gave the highest absorbance value in case of PSE and PPA while in case of EPH; the maximum absorbance intensity was produced by using methanol as a diluting solvent. On the other hand, dilution with dimethylformamide and dimethylsulfoxide resulted in high back ground absorbance of the blank. Each of 1%, (w/v) SDS, 1%, (w/v) cetrimide and 1%, (w/v) tween were tested, hopefully they may increase the absorbance value of the reaction product. Unfortunately, no marked increase in the absorbance value was observed. Therefore, the reaction was carried out omitting SAA. The reaction product was found to be stable for at least 60 min at room temperature. The validity of the proposed methods was tested regarding linearity, specificity, accuracy, repeatability and precision according to ICH Q2 (R1) recommendations . The absorbance concentration plots were rectilinear over the ranges of 2-20 for PPA and 1-14 μg/mL for both of EPH and PSE, respectively, cited in Table 1. The proposed method was evaluated for the accuracy as percent relative error (% Er) and the precision as percent relative standard deviation (% RSD) (Table 1). The limits of quantitation (LOQ) and (LOD) were calculated according to ICH Q2 (R1) recommendation . The results are shown in (Table 1). Where Sa is the standard deviation of the intercept of regression line, and b is the slope of the regression line. To test the validity of the proposed method, it was applied to the determination of pure sample of PPA, EPH and PSE over the concentration ranges cited in (Table 2). The results obtained were in good agreement with those obtained using the comparison methods [35–37]. Statistical analysis of the results using Student t-test and the variance ratio F-test  revealed no significance differences between the performance of the proposed and comparison methods regarding the accuracy and precision, respectively (Table 2). The spectrophotometric comparison method  for PPA depends on its determination via reaction with NBD-Cl and measuring the absorbance of the reaction product at 455 nm. The comparison method for EPH  was through Charge transfer reaction using p-chloranil and acetaldehyde and measuring the absorbance of the reaction product at 680 nm. On the other hand, the comparison method for PSE was based on measuring first derivative ratio derivative of PSE in 0.1 N HCl . a Each result is the average of three separate determinations. *Values between parentheses are the tabulated t and F values, at p 0.05(38). The validity of the methods was proved by statistical evaluation of the regression line, using the standard deviation of the residuals (S y/x ), the standard deviation of the intercept (S a ) and standard deviation of the slope (S b ). The results are abridged in (Table 1). The small values of the figures indicate low scattering of the calibration points around the calibration line and high precision. 3.2.4.i. Repeatability: the repeatability was performed through replicate analysis of three concentrations of the three drugs over the specified working concentration range in pure form on three successive occasions. The results are presented in (Table 3). * Each result is the average of three separate determinations. 3.2.4.ii. Intermediate precision: intermediate precision was tested by replicate analysis of the three drugs in pure form using the concentrations shown in (Table 3) for a period of 3 successive days. The results are summarized in (Table 3). The robustness of the proposed method was examined by evaluating the influence of small, deliberate variations in the method variables on the absorbance of the reaction product. 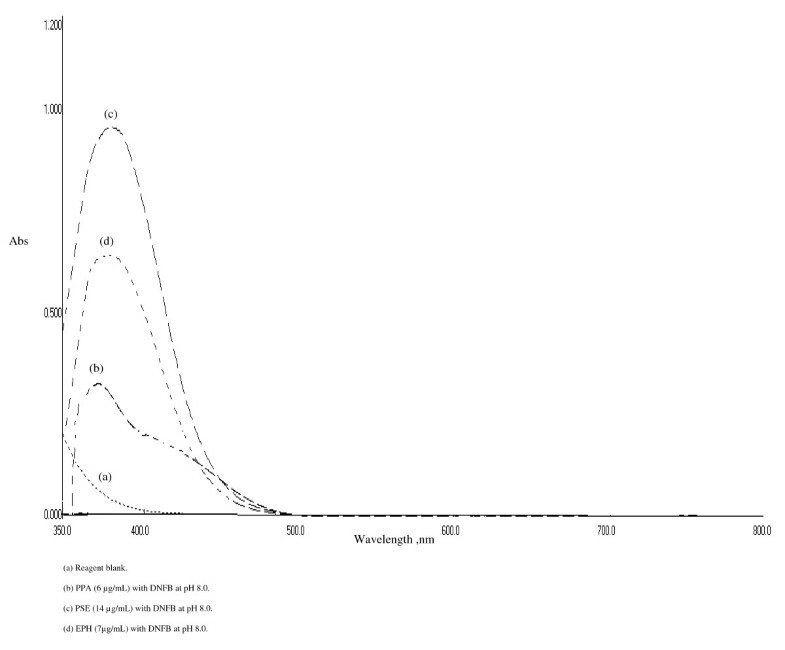 The tested variables included; the pH 8.0 ± 0.5 for the three studied drugs, the change in the volume of the buffer solution 0.8 ± 0.2 mL for PSE, 1.0 ± 0.2 mL and 1.0 ± 0.5 mL for PPA. The change in the volume of DNFB 0.3%, (v/v), 0.8 ± 0.2 mL for PSE, 0.6 ± 0.1 mL for PPA and 0.8 ± 0.2 for EPH, the change in the heating time, 25 ± 5 min for PSE and EPH and 20 ± 5 min for PPA. These minor changes that may take place during the experimental operation didn't affect the absorbance of the reaction product. The selectivity of the method was investigated by observing any interference encountered from the common tablet excipients such as talc, starch, magnesium stearate and avicil. These excipients didn't interfere with proposed method (Table 4). a Contaflu tablets, batch # 061342, each tablet labeled to contain 24 mg of phenylpropanolamine HCl, 3 mg of chlorpheniramine maleate and 200 mg of propyphenazone, product of Egyptian Int..Pharmaceutical Industries CO. E.P.I.CO,10th of Ramadan City, Egypt. b Ephedrine ampoule:-batch # 11 each ampoule (1 mL) labeled to contain 30 mg of ephedrine HCl, A product of Chemical industries Development(CID)-Giza-A.R.E. c Allercet capsule, batch # 820304, each capsule labeled to contain 30 mg pseudoephedrine HCl and 10 mg cetirizine HCl, product of Global Napi Pharmaceuticals, 6th of October City-Giza-Egypt. d PPA content found in Contaflu tablet was found to be 23.94 mg/tablet. e EPH content found in Ephedrine ampoule was found to be 30.34 mg/ampoule. f PSE content found in Allercet® capsule was found to be 30.36 mg/capsule. The proposed method is specific for the determination of EPH in the presence of its metabolite (deaminated form), since the latter is devoid from secondary aliphatic amine which is essential for the reaction with DNFB. The proposed method was successfully applied for determination of the studied drugs in their pharmaceutical preparations. The results obtained were statistically compared to those of the comparison methods [35–37]. Using student's t-test for accuracy and the variance ratio F-test for precision as recorded in (Table 4) revealed no significance difference in the performance of the two methods, respectively. Upon oral administration of 30 mg of PSE, it was found that up to about 90% of the dose is excreted unchanged in the urine in 24 hours with less than 1% as norpseudoephedrine (cathine) . This initiated the present study. Such concentration lies within the working concentration range of the present study. Therefore, the proposed method was applied for the determination of PSE in spiked human urine. The extraction adopted by Avois et al  was applied here (Table 5). The stoichiometry of the reaction was studied adopting the limiting logarithmic method . 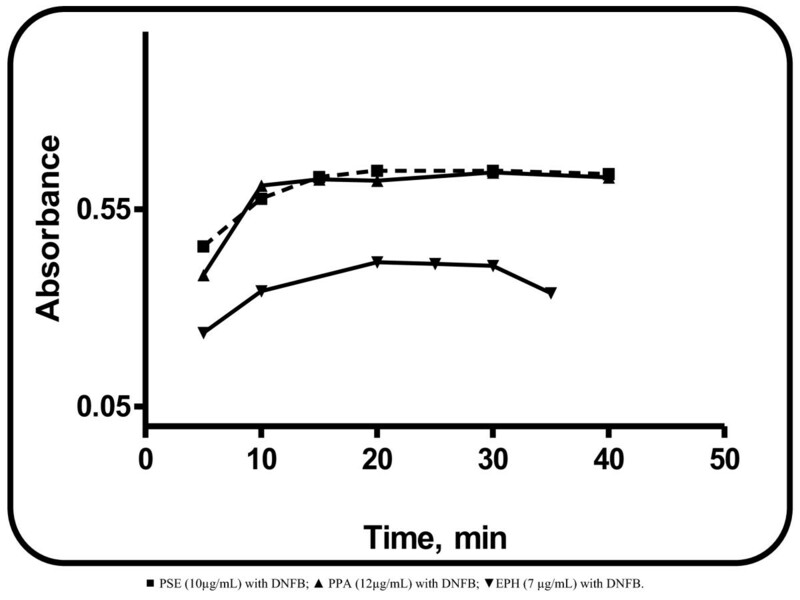 Plots of log absorbance versus log [DNFB] and log [Drug] gave two straight lines, the slopes of which were 0.57/0.78 for DNFB/PPA, 0.41/0.37 for DNFB/EPH and 0.72/0.94 for DNFB/PSE (Figure 8). Hence, it was concluded that the reaction proceeds in the ratio of 1:1, confirming that one molecule of the drug condenses with one molecule of DNFB. Based on the observed molar ratio and by analogy to previous reports , the mechanism of the reaction is postulated to proceed as shown in the following scheme 1. Limiting logarithmic plots for the molar reactivity. Proposed reaction pathway between DNFB and PPA as a model example of the three drugs under the described reaction conditions. The proposed spectrophotometric method provided simple, reproducible and accurate method for determination of PSE, PPA and EPH. The established method was validated and applied to determination of the studied drugs in their dosage forms without interference from common excipients. The developed method showed to be a simple and suitable technique to quantify these drugs and might be employed for quality control analysis. MIW designed the proposed method. NME coordinated the study and modified the text. SS carried out the experimental work and analyzed the data statistically. All authors read and approved the final manuscript.